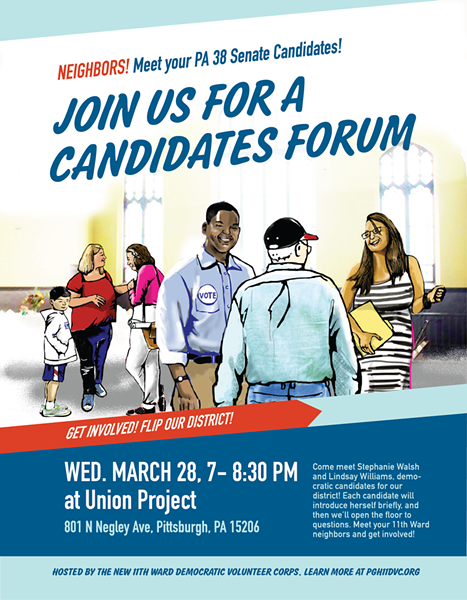 The 11th Ward Democratic Volunteer Corps is holding a forum this Wednesday where the two Democratic candidates for PA State Senate in the 38th District, Stephanie Walsh and Lindsay Williams, will have an opportunity to meet constituents, talk about their positions and answer your questions. Please feel free to spread the word and bring your neighbors - we look forward to seeing you! For more information about the 11th Ward Democratic Volunteer Corps please visit pgh11dvc.org.